The lithe blur of a point guard darted around a brick wall of a screen. 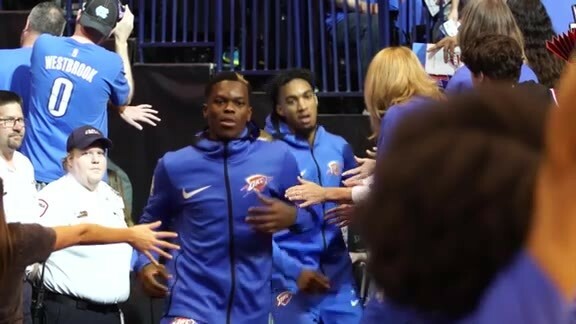 Donning a full long sleeve shirt under his jersey, a sight not seen in a normal NBA game, Thunder newcomer Dennis Schröder spurted downhill to the basket and was up near the rim in a flash, laying in an elegant finger roll. Along the perimeter, during the Thunder’s annual Blue & White Scrimmage on Sunday, Schröder had a menu full of options. Paul George, the dynamic All-Star forward, was moving in and out of positions along the wing, curling around screens and finding openings to receiving passes. Trailing in transition or spotting up in the corner was Patrick Patterson. The burly yet deft Steven Adams was barreling down the middle of the lane presenting a wide target. Schröder hit them all, aiding the White squad in a blowout victory over four quarters against the Blue team. Russell Westbrook (knee), Andre Roberson (knee), Alex Abrines (back spasms) and Abdul Nader (knee soreness) did not participate in the scrimmage that accentuates U.S. Cellular Training camp. Second year guard Terrance Ferguson played just seven minutes before sitting out the rest of the scrimmage with a minor shoulder contusion. Still there was plenty to see, and to like, from the Thunder’s first public opportunity to get up and down the floor. Schröder led the White team’s starters and got off to a scintillating 7-of-7 shooting start from the field on his way to 22 points, 8 rebounds and 12 assists. George was electric as well, scoring a game-high 23 points on 7-of-14 shooting to go with 8 rebounds and 6 assists. Adams chipped in 13 points, but the standout on Sunday afternoon was Patterson, who drained 5-of-6 three-point attempts on his way to 20 points. After missing nearly all of the summer of 2017 due to knee surgery, Patterson came into training camp this season completely healthy and it showed. His body looks muscular and his conditioning and rhythm were strong. 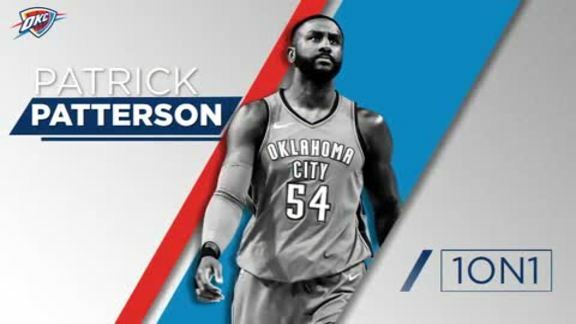 It still remains to be seen who will start at power forward for the Thunder this year, but Patterson looked like a player who will certainly be playing an important role. The White team was mostly stacked with rotation players, as Donovan wanted to get his core guys playing together to develop chemistry. Still, Donovan experimented with different lineups like playing Adams and center Nerlens Noel together, along with Schröder and point guard Raymond Felton. Players like Hamidou Diallo – who wowed the crowd with a pair of monster transition dunks – switched teams during the afternoon, and Donovan made sure to get the guys a good run without overextending minutes. The Blue group, which featured Jerami Grant and Tim Luwawu-Cabarrot in the first half, put up a fight but couldn’t make shots from distance, going just 1-of-23 from behind the arc. 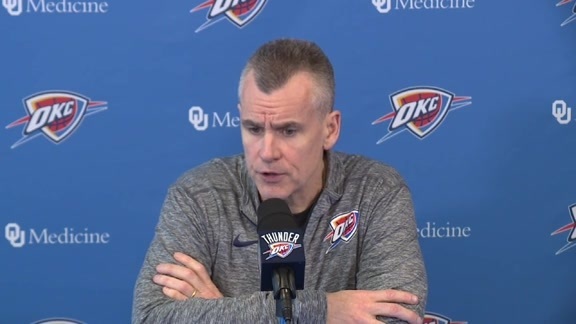 While the statistics looked good defensively for the Thunder, there is still more analysis to do by the coaching staff to determine areas for improvement on that end of the floor. 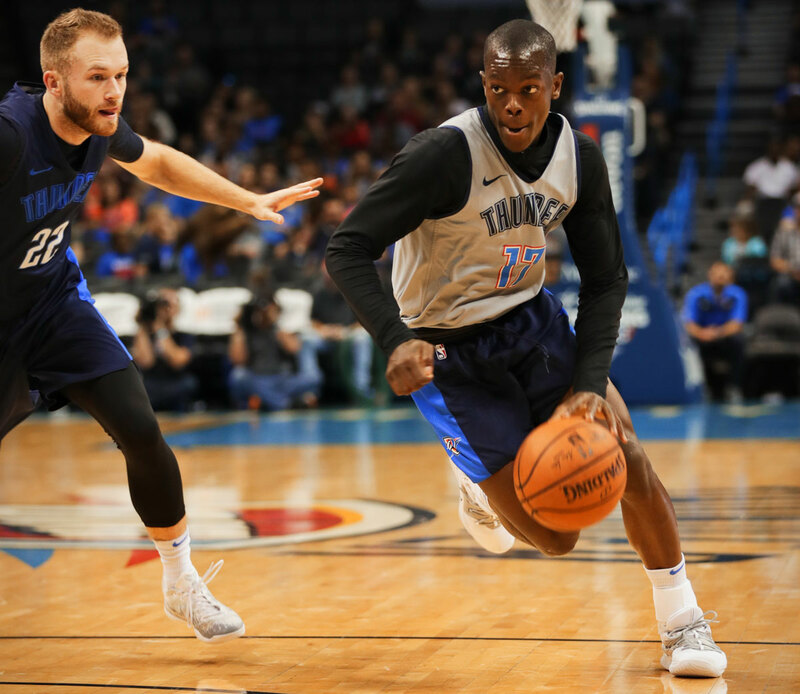 Overall, Sunday’s scrimmage was a wonderful event that helped include Oklahoma citizens in the Thunder’s process of cohesion during camp. There are still four preseason games remaining before another week of practice serves as the lead up to the start of the regular season, and some huge pieces to the Thunder puzzle were missing today. But if the Thunder plays with the tempo, stamina and tenacity that it showed in this early season scrimmage, there’s going to be plenty for the faithful fans to enjoy in 2018-19.